In the gray winter months, Community has brought a refreshing splash of vibrancy to the Schuylkill Center. 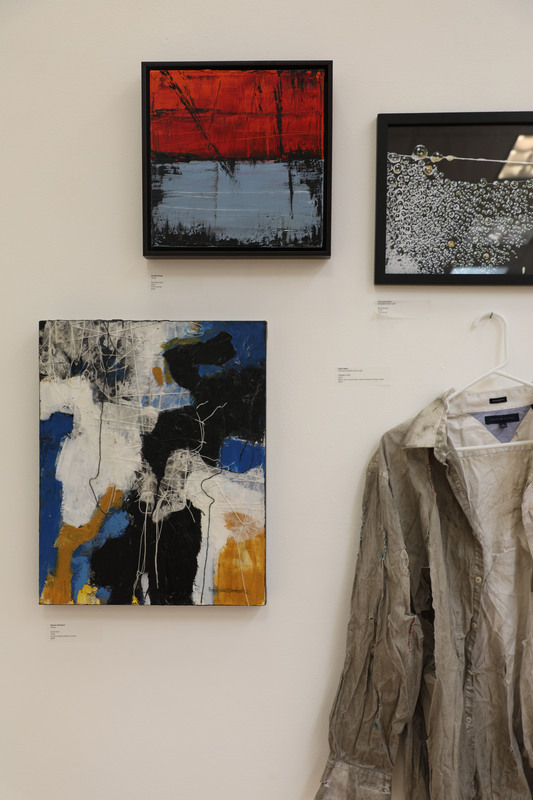 Our gallery bursts with color and texture, from chunky knits to intricate wood carvings to sleek photography. 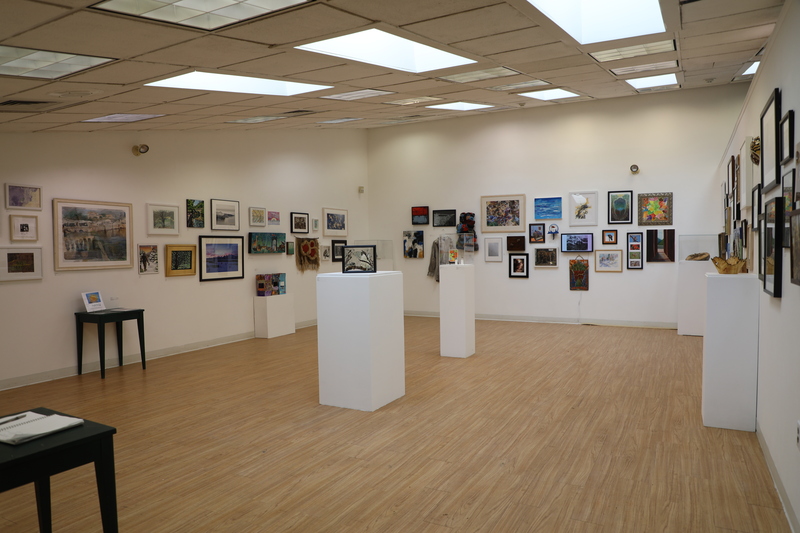 The diversity of the show is the product of a collaborative community effort, speaking to the impressive creativity and talent of our Schuylkill Center members, neighbors, staff, volunteers, and friends. The start-to-finish creation of this exhibition was a fruitful process. So, how did we go from bare white walls to the captivating display that’s transformed the gallery? Here’s the inside scoop. This rendition of Community is its second presentation at the Schuylkill Center, the first being in 2017. 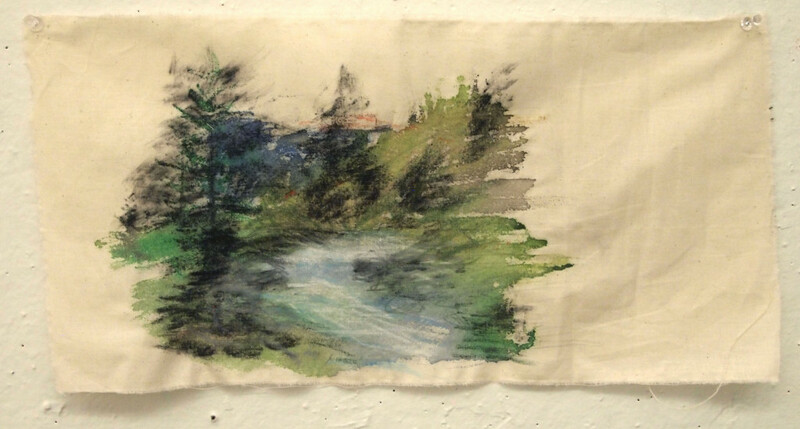 Once again, local artists were invited to submit one to three pieces of all shapes, sizes, and mediums, with works related to nature and the environment or depicting the Schuylkill Center itself of special interest. The enormous outpouring of participants came as a welcomed, celebrated shock, but one that required some rearranging—managing over 90 artists is a tall task. The artist participation almost tripled from our first Community show! In an effort to conform to spatial restraints, artists were asked to choose just a single piece to display. Once the pieces to be exhibited were finalized, the daunting but rewarding task of installation was upon us. Fitting color and pattern together with material and tone and subject took thoughtful consideration. Though the show was wholly uncurated, the distinctive works compliment each other in perhaps surprising coordination largely thanks to the skillful visions of Exhibitions Coordinator Liz Jelsomine and Director of Art Christina Catanese. They deliberately, perceptively placed each piece on the walls, in Plexiglas displays, on carefully mounted shelves. We compiled short biographies, artists’ statements, lists of materials describing mediums, and desired price tags. In the chaos inherent to exhibition preparations, the show slowly began taking form, emerging as a unique display of our community’s capabilities and passions. After finishing touches—the unglamorous work of sweeping and last-minute wall spackling—we were ready for the big reveal. 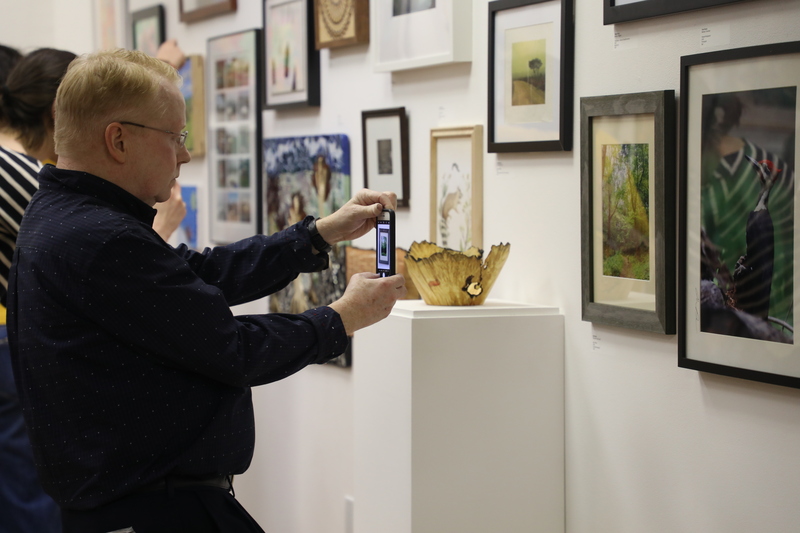 Abuzz with excitement, the gallery’s opening reception was a night to celebrate the artists with friends, family, and a potluck-style meal. 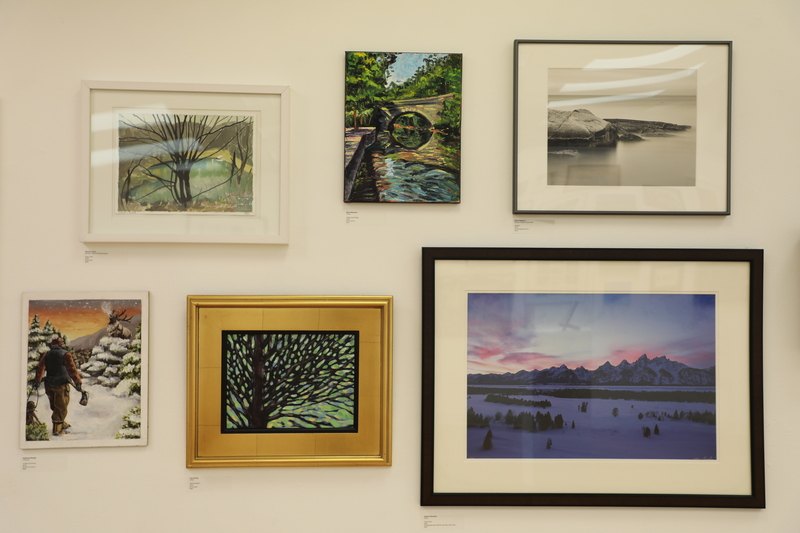 Community will be on display in the gallery until April 27, with many of the artworks for sale and a portion of the proceeds going to the Schuylkill Center. Don’t miss out on an opportunity to show your support and experience our community’s talent! 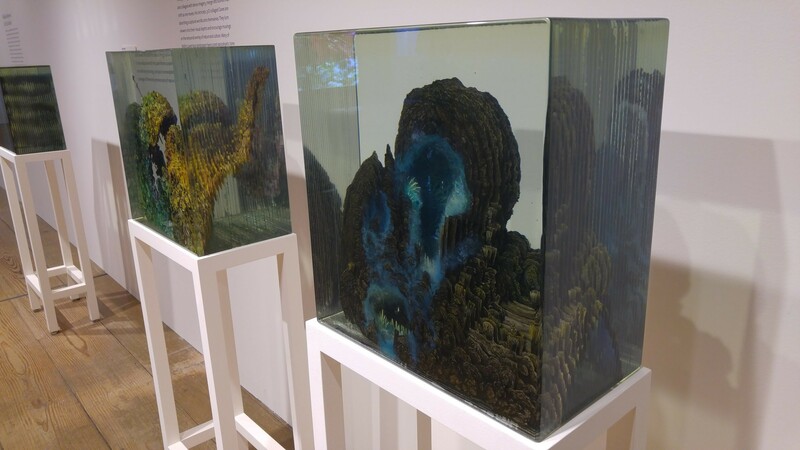 Though artists have always been inspired by nature, with the growing awareness of climate change and other ecological crises, an increasing number engage with themes of nature, landscape, and how people and culture connect to them. 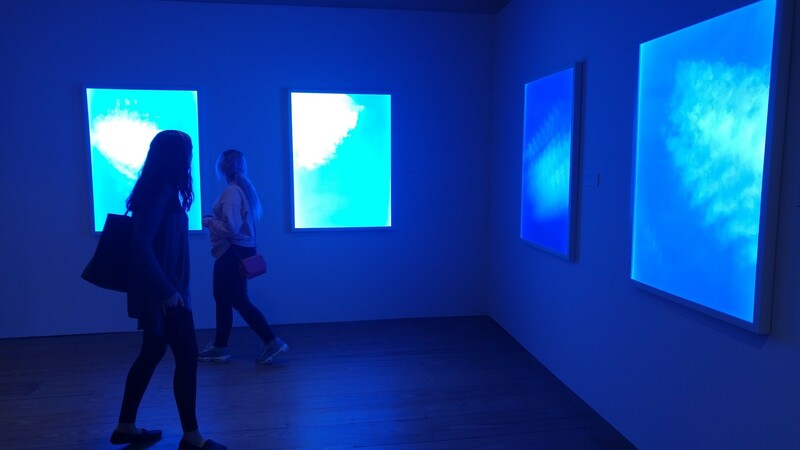 Over the past few seasons, several exhibitions in our region explored these ideas and the Schuylkill Center environmental art staff took a few field trips to enrich our thinking. The relationship between beauty and the sublime is complex. Last fall, the Brandywine River Museum of Art examined this relationship in Natural Wonders: The Sublime in Contemporary Art. 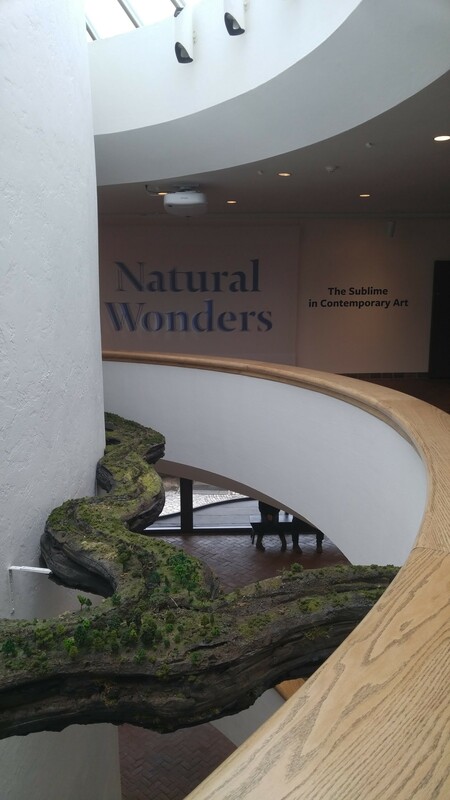 During our visit, Schuylkill Center staff pondered how the Brandywine produced this exhibition, which speaks to the state of nature in the world. The show was a flowing, engaging experience throughout. 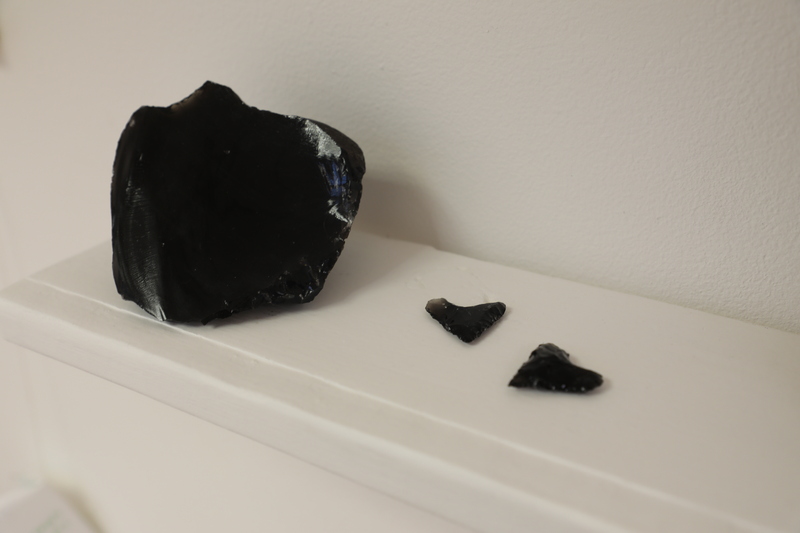 Thirteen artists participated in the show and work ranged from miniatures to 3D printing. 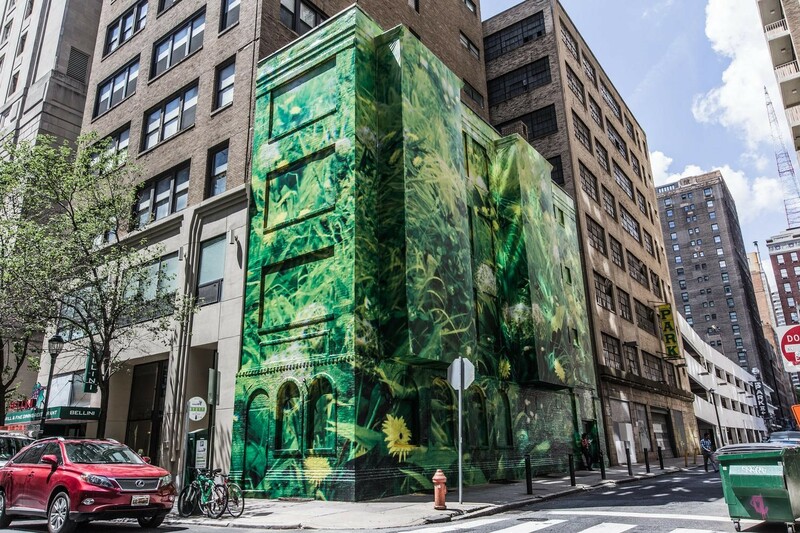 I recognized one of the artist’s miniature work from a larger installation (located in Center City, Philadelphia at 16th & Chancellor Streets). The piece has since closed, but once covered an entire building side (pictured below.) 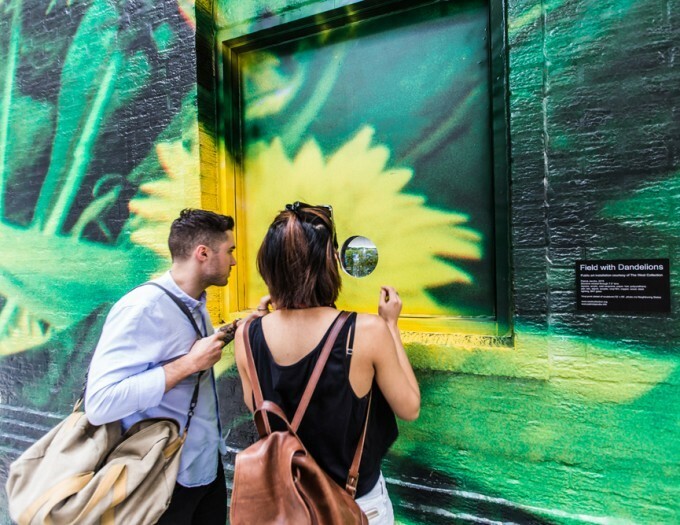 The artist, Patrick Jacobs, had a mural of a dandelion field painted on the side of a building, and upon closer inspection, viewers came across a tiny peep hole, revealing what looked to be a vast landscape of dandelions in the countryside. Issues ranged from species extinction and cultivation of wilderness to designer breeding. Some pieces demanded your attention, like the large videos playing in the gallery, or artificial flowers up to your waist. 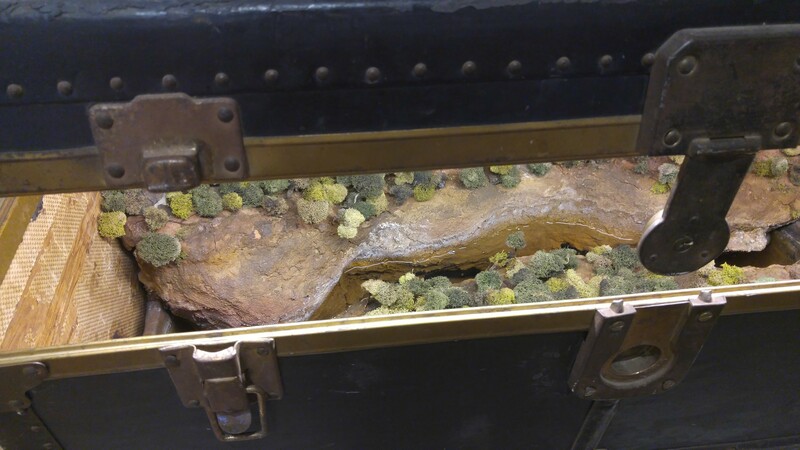 Other works pulled you in, requiring more detailed inspection, such as the little forests and flowing water barely peeking through old suitcase trunks. 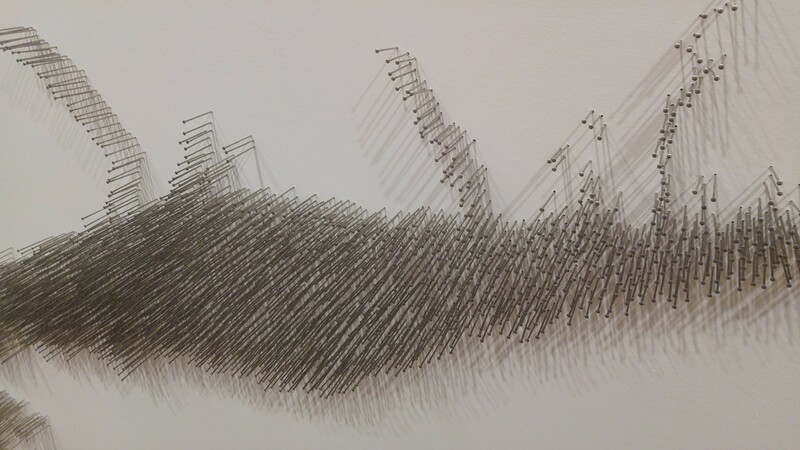 Maya Lin’s Pin River challenged traditional ways of mapping. Instead of highlighting land with water being a part of the landscape, Lin mapped and highlighted the Hudson River as the main focus. Lin mapped only the water bodies themselves, removing other geographic reference points and letting the water’s shape and path stand on its own. In the case of the Hudson, the choice of nails was especially significant given the legacy of heavy metal pollution in the river. 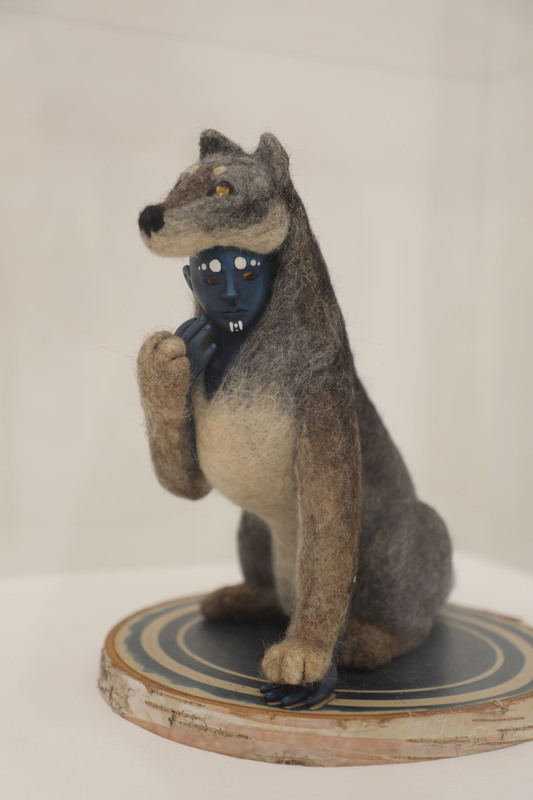 This exhibition included pieces from over a hundred years ago, as well as work made in recent years. Pieces began as traditional works. Artistic views regarding nature and the social landscape at the time could be seen. 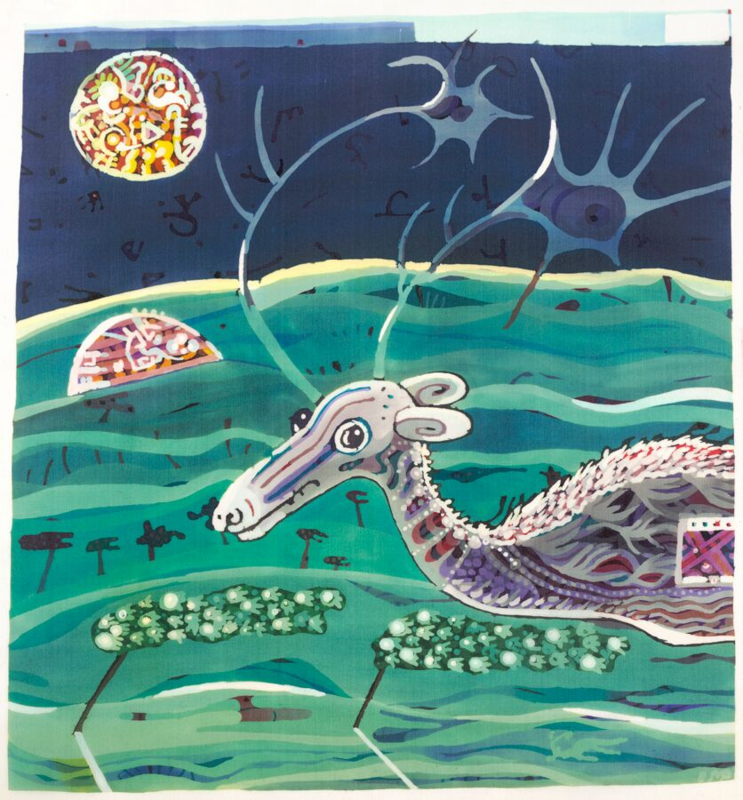 Over time, a shift to contemporary happened, where the views of artists remained present, yet were specific to challenges and outlooks we have with the environment today. Work also specifically focused on the Pennsylvania landscape. As a result, shifts in relationships towards the land were made especially clear. 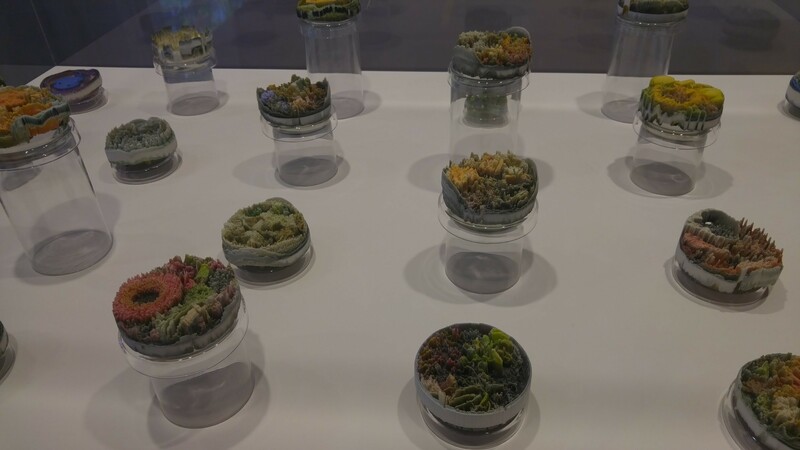 We were delighted to see work in the show by artists we’ve had the pleasure of working with at the Schuylkill Center, including 3D videos by Pete Rose. Layering multiple views of populated areas in the city, such as a skatepark, Rose placed viewers in the space and provided them with a closer look at the people and activities happening there. 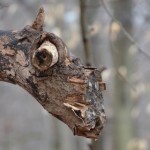 Sandy Sorlien is no stranger to the Schuylkill Center and also displayed images from her INLAND project in our gallery. Sorlien photo documented the 200-year-old abandoned Schuylkill Navigation system that once literally fueled the Industrial Revolution. 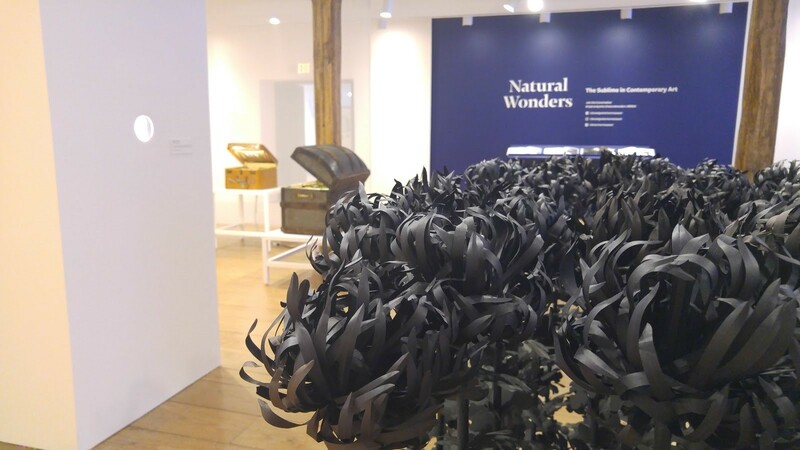 Natural Wonders at the Brandywine River Museum and The Pennsylvania Landscape in Impressionism and Contemporary Art at the Woodmere Art Museum both exhibited art that depicts people relating to the environment, displaying the change in those relationships over time. 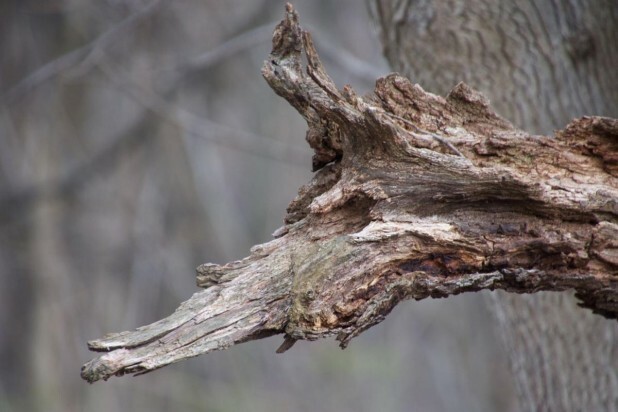 While it may not always be intended or overt, art shows perspectives that individuals have towards our natural world, society, politics, and beyond. 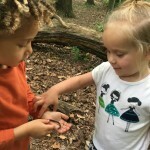 Imagine witnessing a child’s love of nature unfurl through a series of moments: the first time they hold a wiggling earthworm, hear a warbler call, or watch frogs scurry into a pond. These experiences play into the sensory needs of young children and help to bolster their language, fine and gross motor skills, and cognitive abilities. For the first time this spring, we are offering this curriculum to children ages 25–36 months through Fledglings, a “watch-me-fly” program for children and caregivers. This five-week series will use walks and wanders, songs, stories, and art to tap into children’s innate interest in the natural world. 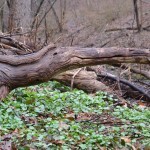 Each week will focus on a different theme as we explore meadows, ponds, and forests. We will also offer an optional Reader’s Club, which includes weekly books to encourage your child’s continued growth and curiosity. Through this program, we invite caregivers to join their children in creating nature-based memories or relax nearby as children develop a passion for and understanding of the natural world. 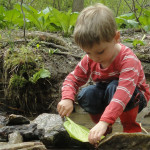 Since Nature Preschool started in 2013, we’ve connected over 700 children to the outdoors through child-centered, inquiry-based learning. We can’t wait to offer this opportunity to littler ones as well. There’s just something about climate change. Despite the fact that predictions grow more dire by the day, it doesn’t feel like an emergency. It can be hard to wrap our minds around something so big and abstract. So how can it become more personal, tangible, visceral? 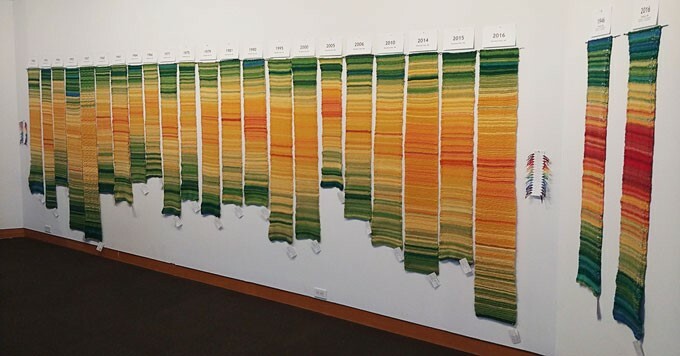 A group of knitters has one idea—by applying their craft to climate change data. The Tempestry Project (https://www.tempestryproject.com/about) is global climate data visualization through fiber arts. A Tempestry is a wall hanging, or temperature tapestry, that represents the daily high temperature for a given year and location, with January at the bottom and December at the top—think of it like a bar graph. 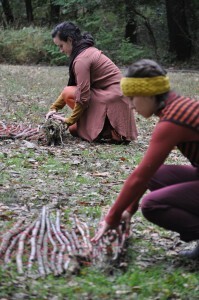 The Tempestry Project was founded by Justin Connelly, Marissa Connelly, and Emily McNeil in Anacortes, WA. All Tempestries use the same yarn colors and temperature ranges, creating an immediately recognizable and globally comparable mosaic of shifting temperatures over time. If the high temperature is a roasty 96 degrees, the row for that day will be Cranberry, a rich red. If the polar vortex has just come through and the high is just 11 degrees, that row will be Fjord. The illustrative names of the yarn colors are an additional delight. I’m a hybrid science/art person already, plus an avid knitter, so I couldn’t be more excited by this project. I finished my first Tempestry this winter. I chose 2017 in Cooksburg, PA, the year and place where my husband and I got married. I even knitted in a little silver thread for our actual wedding day; with an 84 degree high, it was a lovely row of Papaya. People all over the world are making these Tempestries, assembling a global mosaic of shifting temperature patterns, row by wooly row. 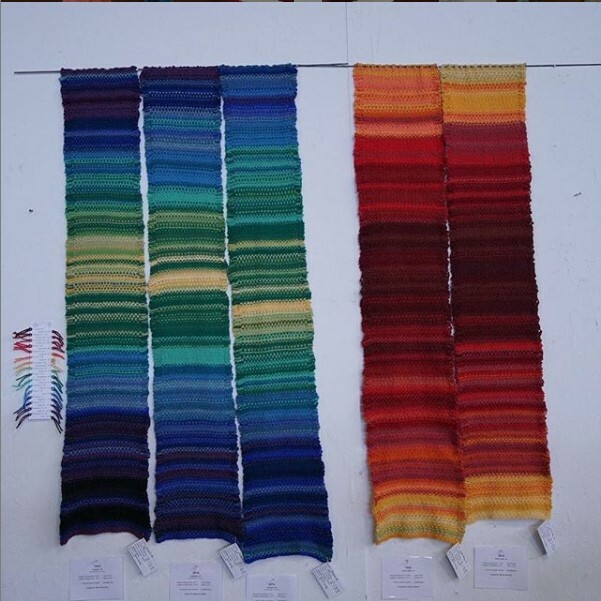 It’s gratifying to be part of a connected global network of fiber artists putting their energy toward raising awareness, and I found that the mindfulness of knitting and sitting with this global challenge helped me process my own feelings about it. A single Tempestry is meaningful on its own as a snapshot, a moment in time, a commemoration. But a collection of Tempestries reveals change over time. What if we had a whole slew of Tempestries for one place? Would we visually see the shift, as models predict for Philadelphia, to a hotter, wetter world? During 2019, the Schuylkill Center will coordinate a collection of Tempestries that show daily maximum temperature data over several years for Philadelphia. The collection will be on long-term display at the Schuylkill Center to educate about how climate change is impacting our region. We are seeking knitters and crocheters to get involved in creating this collection! 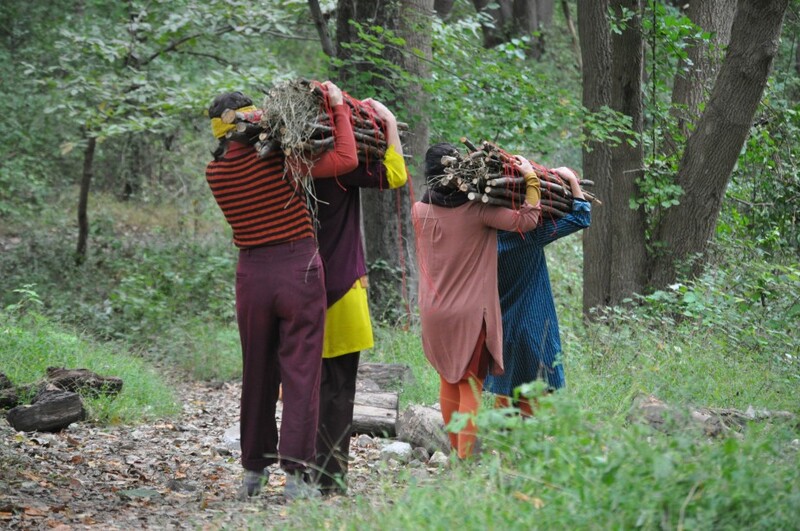 To get involved, please contact me, Christina Catanese, at christina@schuylkillcenter.org or 215-853-6269. 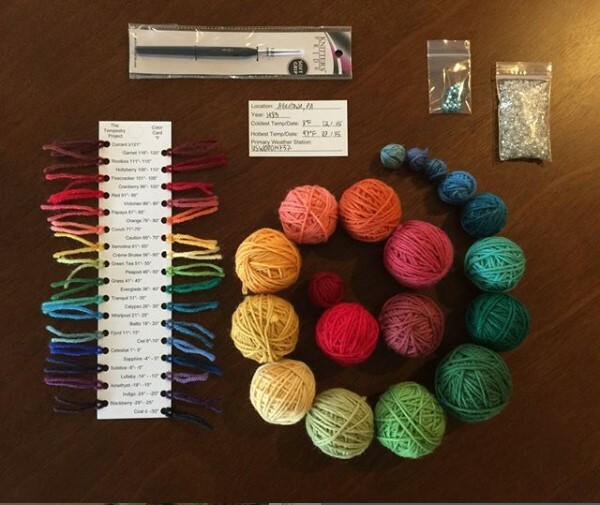 We’ll be holding a kickoff meeting this spring for interested crafters to learn how to start making a Philadelphia Tempestry and assemble and distribute yarn kits for the collection. 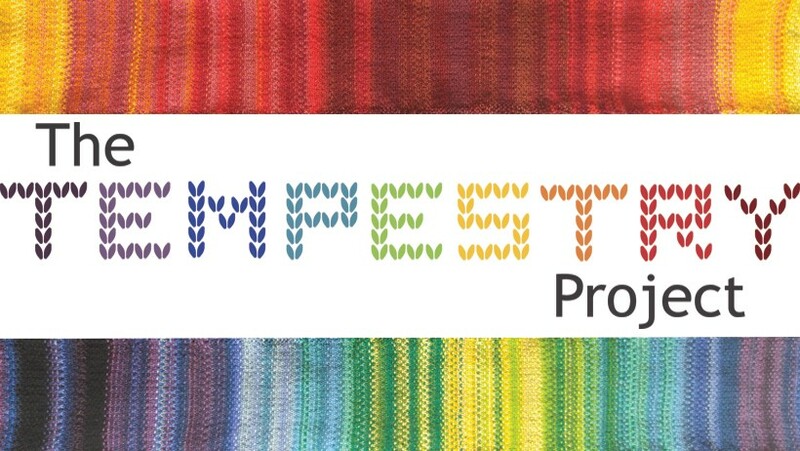 Update 3/19/19: We have received an amazing response to this project and currently have more than enough volunteers to knit/crochet Tempestries complete our 30 piece collection! But there are still ways you can get involved. Contact Christina to be added to the list of alternates, in case any of our current team is not able to complete their Tempestries. Help assemble yarn kits for knitters – contact Christina for more information on this, and note whether you have access to a digital scale that measures in grahams and/or a ball winder. 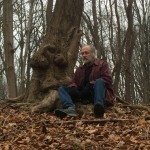 Make a donation to the Schuylkill Center to support this project: visit https://schuylkillcenter.pivvit.com/make-a-gift and include “Tempestry Project” in the notes field. It’s Valentine’s Day, that day set aside to think about the things we love. Bob and Nancy Elfant, local residents and strong supporters of the Schuylkill Center’s Wildlife Clinic, love animals. “We both have a soft spot in our heart for animals,” said Bob last week. “And needy animals,” chimed in Nancy, noting their adoption of two rescue dogs 11 years ago. The Elfants were making a visit to the Wildlife Clinic, being given a tour by Chris Strub, the clinic’s assistant director. Bob is a founding partner of both Elfant Pontz Properties and Elfant Wissahickon Realtors, the latter with its cheery yellow “For Sale” signs (note the squirrel logo– there’s that love of animals again) visible across the region. Nancy, a former social worker, is recognized by many as a former owner of Germantown Avenue’s Trolley Car Diner, where she ran the front of the house for many years. 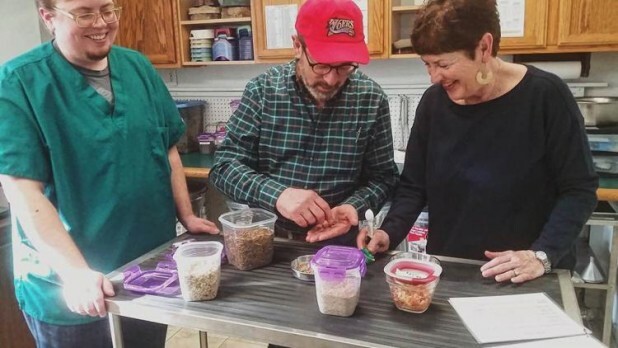 In the fall, the couple make a generous leadership gift to the Schuylkill Center that helped us reopen our Wildlife Clinic, closed, as noted here many times, through much of 2018 while we searched for a new director. Their support for the Wildlife Clinic became even more concrete recently when the Elfants brought a cardinal there a few weeks back. Outside of their family room, they’ve long maintained a series of feeders where they watch chickadees nibbling on suet, blue jays noisily eating seeds, goldfinches working the thistle feeder, hummingbirds sipping nectar, and more. And yes, they have decals on their windows to lessen the odds of window strikes by birds mistaking reflections in the glass for sky. Even with the decals, they recently heard a thud against the window, and Bob had “that feeling where your heart goes into your stomach. We ran to the window, and the cardinal was laying there outside, clearly alive, clearly stunned.” They carefully placed the bird in a box and brought it immediately to the Wildlife Clinic. 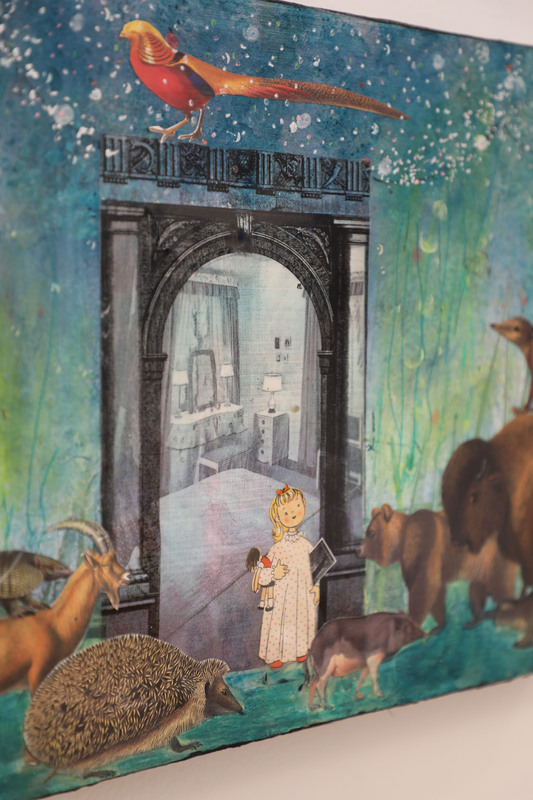 The cardinal stayed overnight for observation, and the next day Rebecca called the Elfants with the happy news to “come get your cardinal, you can bring her home.” Bob was especially excited that Rebecca referred to it as “your cardinal,” giving them ownership of the experience. 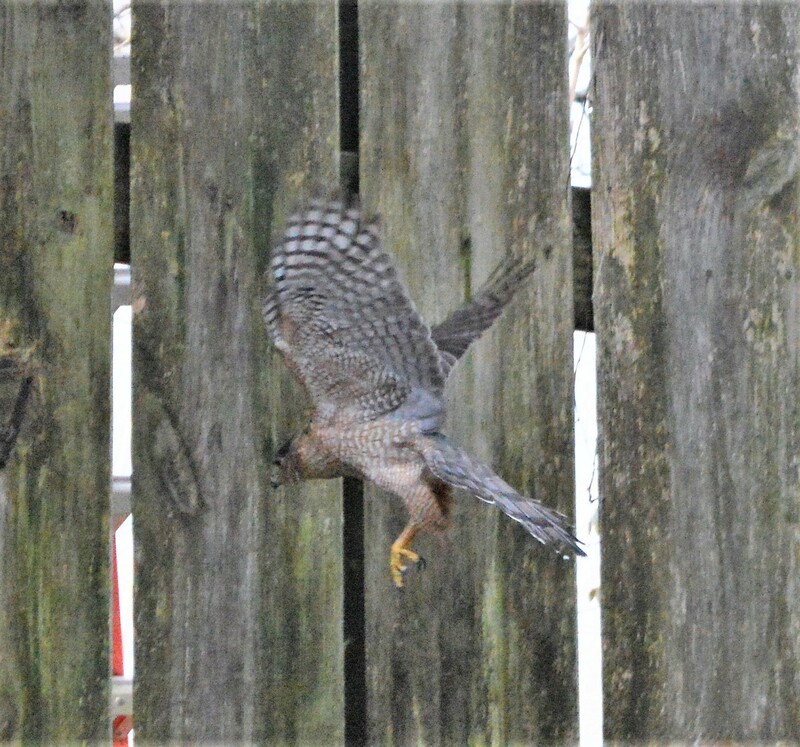 They released it that day in their backyard, Nancy capturing a photo of the bird shooting out of the box, the cardinal a mid-air blur of red. “We encourage people to do something,” Nancy concluded. There are innumerable ways to support the Wildlife Clinic’s mission to protect wildlife in Philadelphia. Donations to the clinic are welcome– and can be offered online– but donations of in-kind materials can also be made; check out our website’s list. Plus there is an Amazon wish list there as well, so you can purchase a needed amenity for the clinic and have it shipped there directly. You can also volunteer for the Wildlife Clinic, as almost 100 people have already done since the clinic reopened in November. Call the Schuylkill Center at 215-482-7300 to begin the volunteering discussion. On Valentine’s Day, we join the Elfants in declaring our love for animals, and invite you to join the Elfants in showing that love by donating to the Wildlife Clinic. 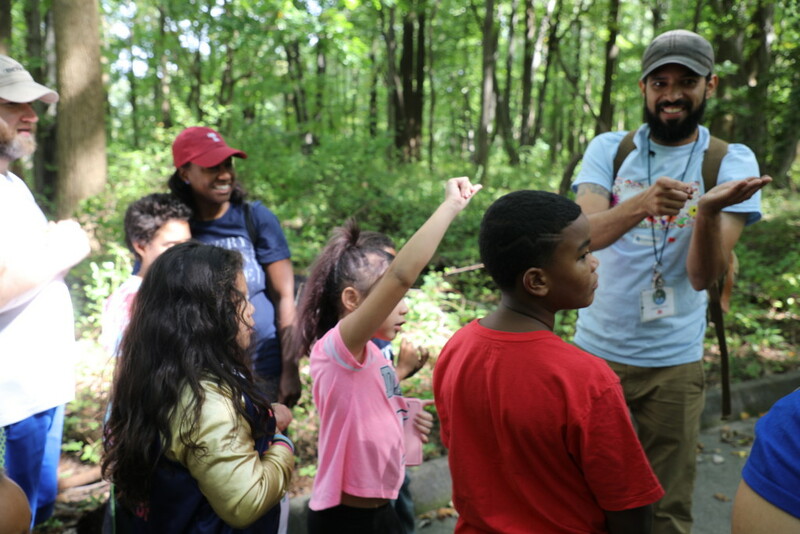 Mike Weilbacher directs the Schuylkill Center for Environmental Education in Roxborough, tweets @SCEEMike, and can be reached at mike@schuylkillcenter.org. While the Federal government remains mired in the longest shutdown ever (I am writing this on Sunday, so the fluid situation may change dramatically by the time you read this), a new caravan was scheduled to leave Honduras this week, thousands more beginning the long trek north to Mexico and the U.S. 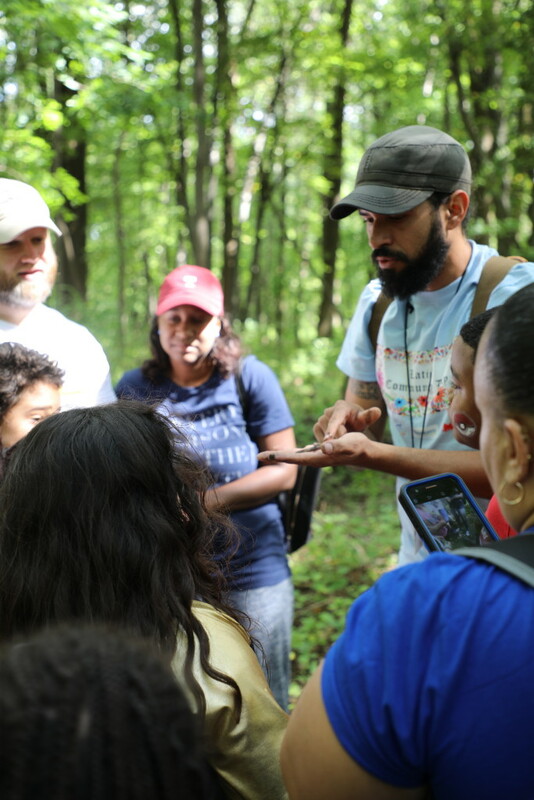 This sad, hard, complex situation brought me to Eduardo Duenas, the Schuylkill Center’s Manager of School Programs, an educator on our staff who oversees a cadre of educators that help him teach school children on their visits here. A native Honduran, Eduardo has been in America for most of the last four years, the Schuylkill Center for the last two, and has permanent resident status with the U.S. Citizenship and Immigration Services. He’s married to an American citizen, and they are raising twin infant sons. And he’s easily the biggest– or at least the most vocal– Eagles fan on our staff, bleeding Eagles green. He visited Honduras with his family over the Christmas break, some of his kin meeting his sons for the first time, and came back devastated– his home city of La Ceiba on the Caribbean coast “has never been so dirty,” and was surprisingly empty, almost a ghost town, as many of the Hondurans once there have left for elsewhere. Valle del Aguán is also one of the most fertile regions in Honduras, its rich soil growing coffee, bananas, mangos, pineapples, and more. “But we made deals, stupid deals, with foreign companies for like 100 years for one dollar,” one of the reasons the economy is bankrupt– people don’t control land or agriculture. He left Valle del Aguán after high school, moving to the larger coastal city of La Ceiba so he could attend university. After an ill-fated stint in law school, he finished a degree in ecotourism, where he could be closer to the animals he loves. He tried making a life in Honduras– he has been a tour guide for ecotourism companies, a fisherman (snorkeling with a spear to catch fish), a landscaper pulling weeds and planting trees, even a street musician and artist; he has tried many things. But after he was pulled over by the police and detained in jail for a full day for no reason, he decided to leave Honduras. “I had to explain to my mother in 2012 that I didn’t have any opportunities in Honduras,” he said. He went to Costa Rica, where he enrolled in a La Salle University program that led to dual degrees in environmental management and sustainable development. There, he met his wife, a native of Villanova who worked for a company that had offices in Costa Rica. They married in Honduras in 2013, and she soon pushed to live in the U.S., as she thought their chances of making a life were better here. “But I don’t want to go to a place that doesn’t like me,” he said about his first reaction to America, but ultimately agreed. “I applied for a visa,” he remembered, “but it took more than two years to get an answer.” To his great relief, he has only received support for his being in the United States. In 2015, he and he wife spotted a pair of baby owls in the middle of a road. Using cell phones, they discovered that the Schuylkill Center ran a wildlife clinic, and were able to rescue one– the second was sadly struck by a passing vehicle as they were getting out of their car. He volunteered for the Toad Detour program, became a Trail Steward, and is now a full-time educator. So while his journey is uniquely his own, it echoes the tragedy of the current situation in Central America, that thousands of people from Honduras feel their best chance for survival is a dangerous trek north. As the latest caravan starts its long walk north, my thoughts are with Eduardo, his family, his friends, and all Hondurans. What does community mean to you? 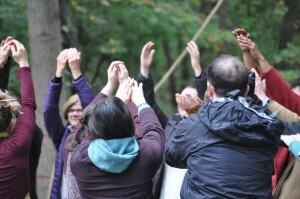 Here at the Schuylkill Center, community means connection. 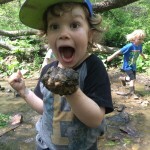 We offer a wide range of ways for humans of all ages and backgrounds to engage with nature—whether you are spending time with your family outside at our weekly Schuylkill Saturdays, or attending our Meigs Environmental Leadership Award ceremonies to learn about strides our community members take to further environmentalism. Our community contributes to the Schuylkill Center in a variety of ways, and we are excited to honor all friends, members, volunteers, and staff in an exciting and creative way this winter. 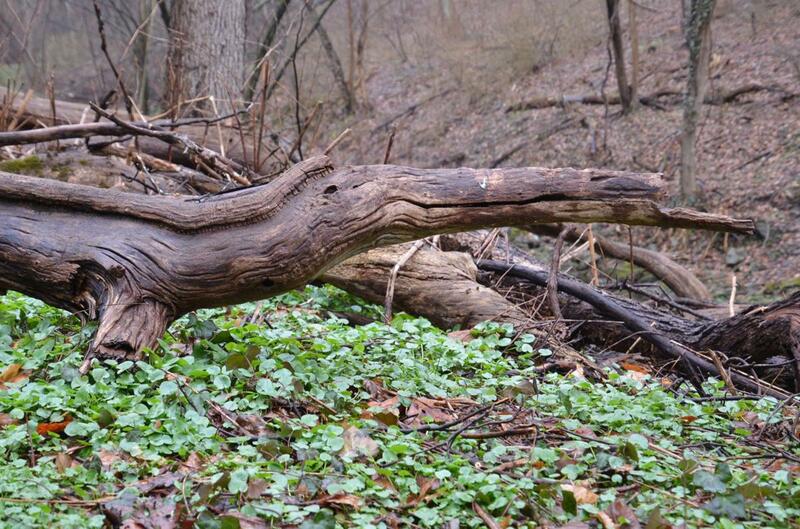 A crucial aspect of the Schuylkill Center is our Environmental Art department. 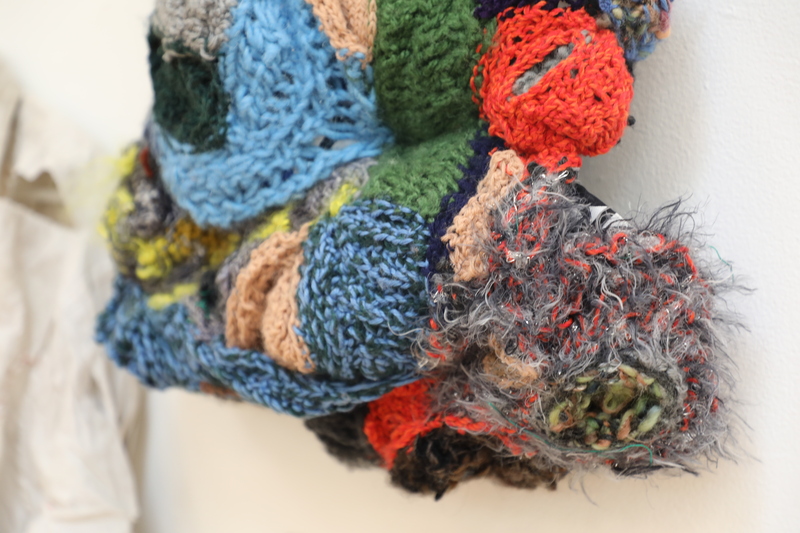 Using art, we are able to seamlessly pair science with physical movement, history with inventive up-cycling, and math with textiles. 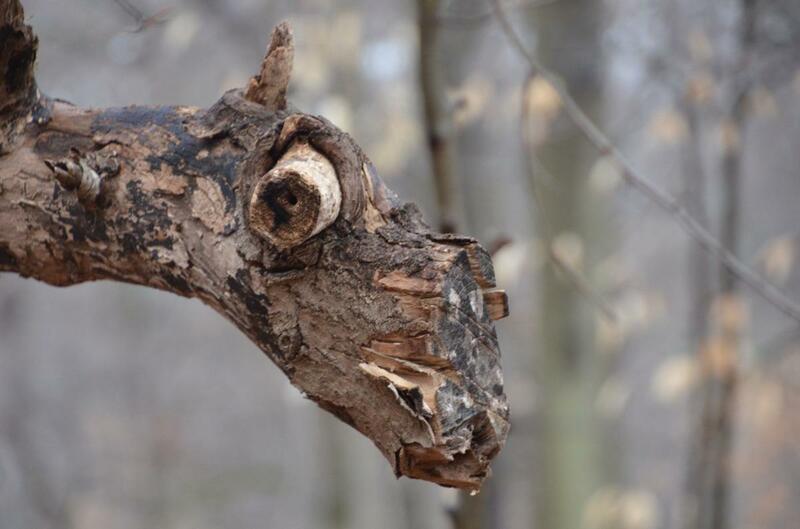 Art bridges the gap between all facets of life, and we especially value how it is connected to the environment. 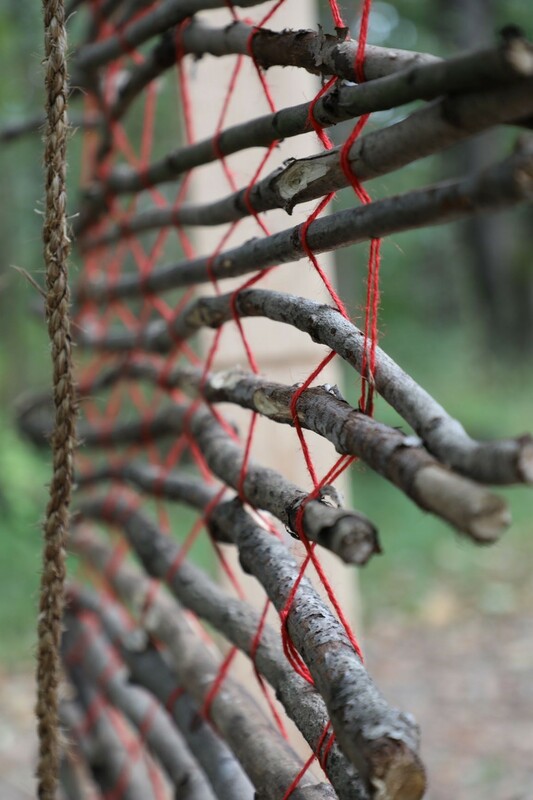 Our gallery has been the home for a vast number of environmental art projects since its expansion in 2013. 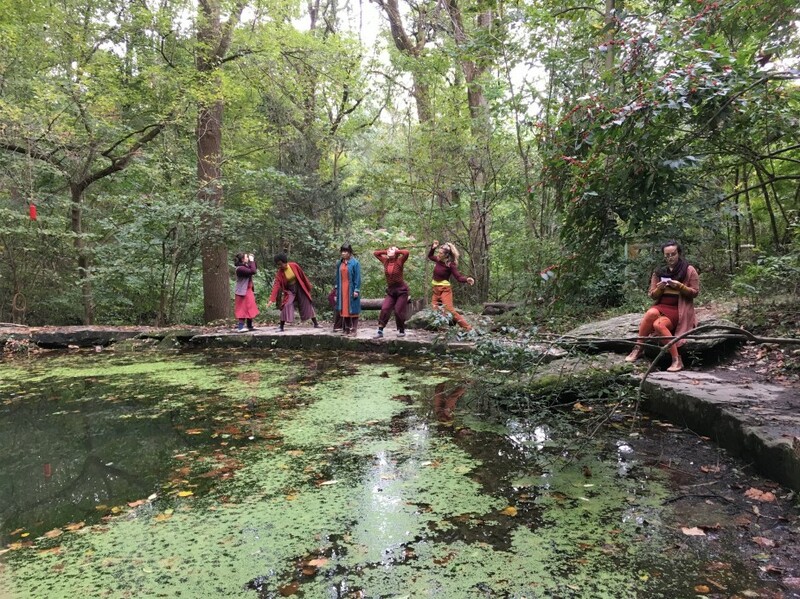 We’ve incorporated animals, mythology, botany, kinetic energy, architecture, geology, fashion, local history, and the Schuylkill Center itself as topics for many environmental projects. But none of these projects were created alone. Contributions from nature and humans made each gallery piece possible. 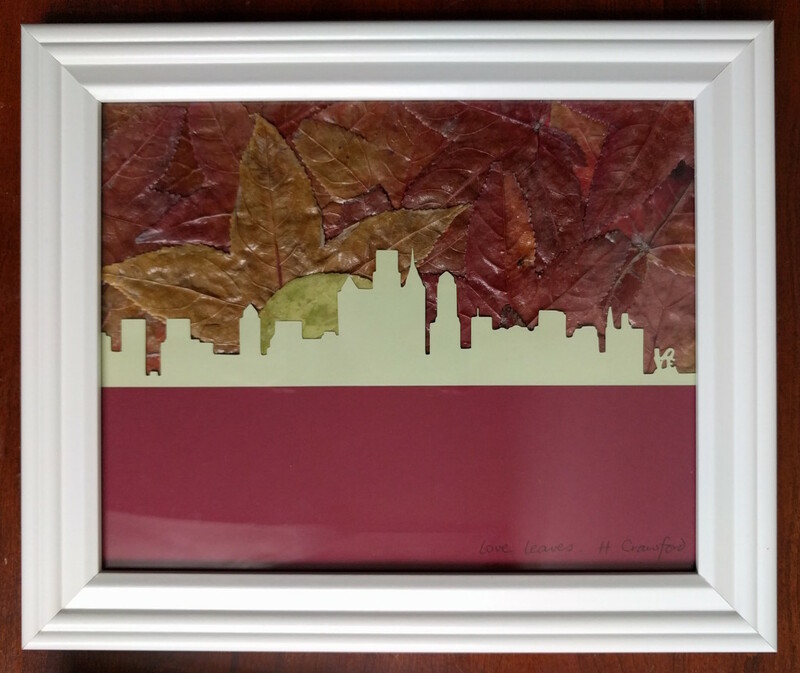 Hayley Crawford’s “Love leaves.” uses materials from nature to display a love for local surroundings. Displayed in Community, 2017. Laura’s “Un Cerf Magique” captures a moment in nature using illuminating colors highlighting the magic and fantastical scenes found outside. Displayed in Community, 2017. 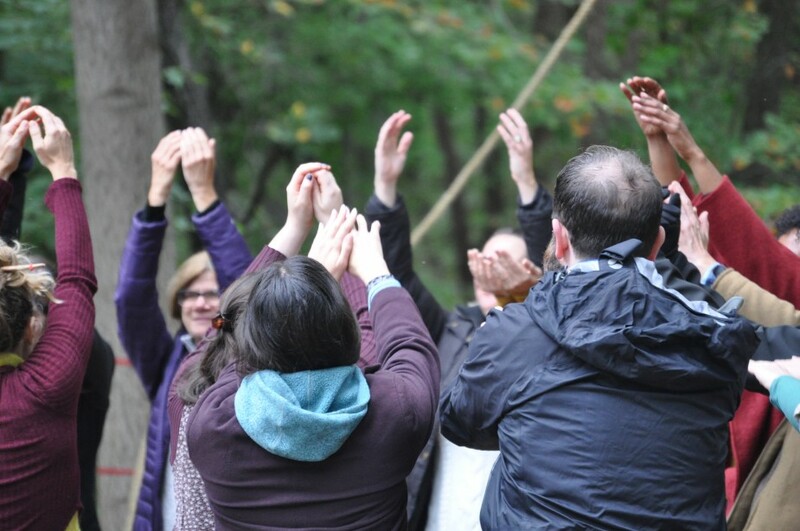 Art connects people to each other and to the environment, and these connections contribute to creating the invaluable community that we are lucky enough to consider a Schuylkill Center family. 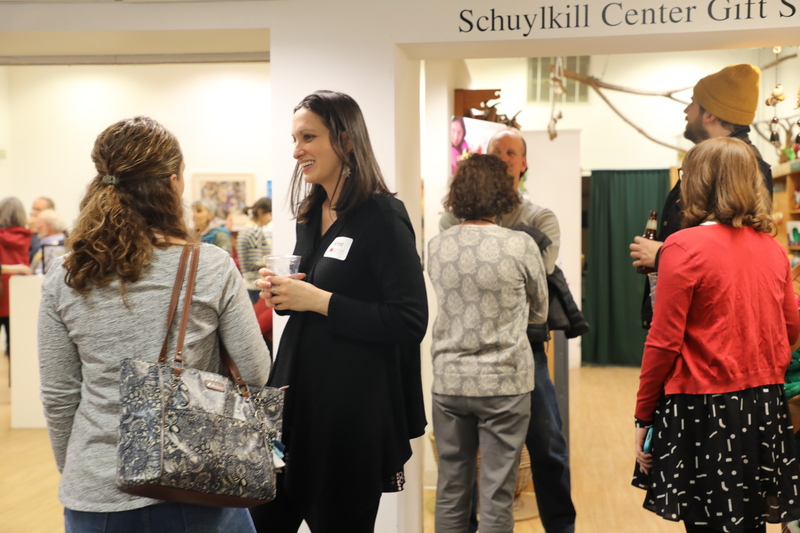 For the second time (after an extraordinary success), we are excited to invite our community to fill the gallery with their own works this February as we celebrate your dedication to the Schuylkill Center and your creative works. 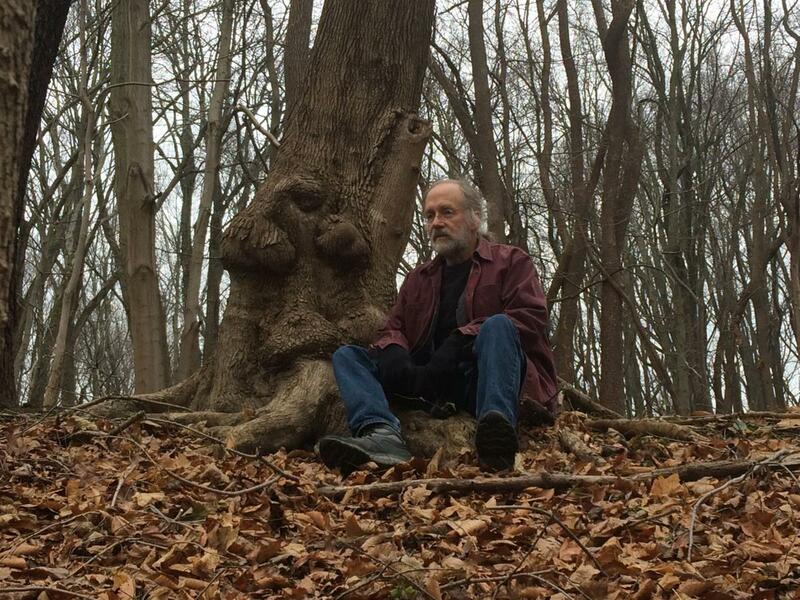 Community, this unique upcoming exhibition, will feature artwork of anyone and everyone involved with the Schuylkill Center. We welcome all art mediums—clay, weaving, photography, woodwork, painting, dance—the possibilities are endless. Read more about our guidelines and how to submit work here (deadline January 6). Kelsey Wimmenaur’s “Water Series 2/3” uses bodies of water as inspiration to express the comfort received from water in nature. Displayed in Community, 2017. When previously done in 2017, we saw this exhibit bring the Schuylkill Center community to life like never before. Barriers were broken and expectations exceeded, and we look forward to seeing what our community has in store for us this time around. Community will be on view in the gallery from February 21 through April 27, 2019. An opening reception will be held on February 21, 2019.